Night Photography is not a simple pursuit; making photographs in the apparent absence of light takes a combination of patience, deep gear knowledge, cooperation with the weather (or non-cooperation!) and technical knowledge about how to achieve a proper exposure. I have over 20 years of experience at night. In the era of film, it was via trial-and-error and accrued personal knowledge. As digital photography matured into what we take for granted today, there was a sea-change for night photographers - the camera became an excellent tool for making consistently great exposures. But with the concurrent advent of smartphones and apps, a wealth of other helpful information also takes a ride with you into the night! Here is a list of useful apps I've used and my pros & cons for each. I just downloaded this on at the suggestion/question from a friend. Surprisingly useful features like the Star Trails calculator. Screenshots below. I like that the display shows you the arc of the stars as you change the Track Length (degree). Track Length (degree). Notice the different lengths on the star trails in the upper left side - an indicator for the visually-oriented versus the math-oriented. There are other useful things in there like Still Stars. But some other things I question the math - like Moonlight Exposure . Based on experience, they suggest exposures much too long for digital exposures. Perhaps they intend to suggest reciprocity-adjusted exposures but that varies by film and you should consult the data sheet for your film and experience before using this as "gospel." Another friend suggested this to me last October at a night photography workshop on Bannerman Island. Sadly, I did not get it until a month or two ago (plus the dongle/cable for my D700). This is a sweet suite of tools for night and day photography. You can use it with the internal camera on your iPhone or iPad, but its real power comes when you plug in your DSLR. Timelapse, TimeWarp (TM), DistanceLapse(TM), Seismic, Peejaboo, Star Trail, Long Exposure HDR, Long Exposure HDR TImelapse and Bramping are things I have used and enjoy. Most notable is Bramping - which allows one to set a time duration, start Bulb time and end Bulb time. Genius! Sunset into darkness or vice versa, this can make a beautiful timelapse with great exposures without counting on autoexposure. DistanceLapse is also fantastic for making timelapses over distance using GPS. Example here as we drove to/from the Valley of Fire. Cons: I don't like that during long exposure sets (like Star Trails) that the App must be always in the foreground (no switching apps!). But you can let the lock screen happen, which will save battery life on your iPhone. I also suggest getting an arm that screws into your tripod spider or clamps on your tripod leg for your iPhone/iPad so that it is not dangling off your camera, plugged into the headphone jack. You can never have enough flaslights! 'Nuff said. Well, maybe not. In a pinch, your iPhone can help you find your flashlight, film, lens cap, etc. AR (Augmented Reality) views of where the Moon and Sun will be, now and in the future! Not especially useful for moon, but especially helps you plan sunsets leading into your night shoots. GREAT planning tool to see when you will/will not have enough moonlight for ambient exposures. Easy calendar view for phases, funny "cheese" setting and ability to set coordinates for observing moon phases elsewhere in the world. I love being able to see on a map where the moon's position will be - especially for when it crests the horizon. Draggable maps, savable locations, sun/moon switch. It's all good. 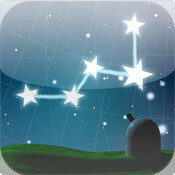 One of the first "planetarium" apps I ever got, and also the first AR, or augmented reality, apps I ever had. There is no experience like opening this on a dark, starry night and moving it around, seeing what all of the stars are, what comets are out and meteor showers. Must-have. And great to use during long exposure to know a little but more about what you are photographing! Photo shoot planning on steroids. A colleague here at work introduced me to this. It's deep. I feel like you need a doctorate to understand its full potential, but it is VERY comprehensive with its set of features. Here is a "starter video" they made to whet your appetite. I will be doing a more in-depth look at Photo Pills on a future date, as it could replace many or consolidate many of the feature sin individual apps above, but I feel obliged to learn more about it first. Not pictured: Apple's native "Clock" app. Use this is set the countdown timer or alarms for your long exposures - especially good for manual exposure cameras like FILM cameras. Also worth mentioning - while authoring this post, I saw on Facebook that someone shared this other post titled, "Smartphone Apps for Night Photography" on David Kingham's website. Check it out! More opinions = better knowledge! Matt Hill is a Night Photographer, Cut Paper Artist, Educator and MarCom Manager at MAC Group.